Yes, Estee Lauder Revitalizing Supreme + Global Anti-Aging Wake Up Balm, you have permission to get aboard my face. And stay there. I have to admit I was sceptical about you (you’re not a makeup product – how much “waking up” can you truly perform on my child-scaring morning visage?) but you’ve properly saved my complexion on dozens of different occasions and are now well and truly part of my emergency makeup routine. 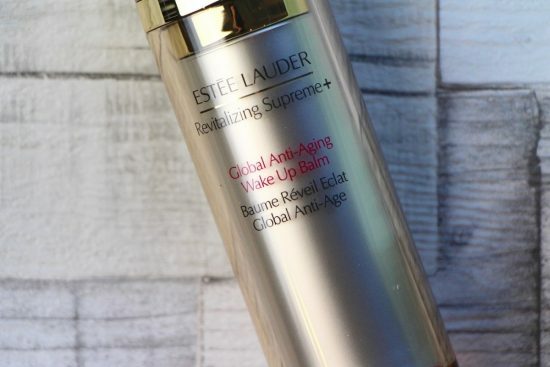 The Estee Lauder Revitalizing Supreme + Global Anti-Aging Wake Up Balm (I’ve aged a decade just writing that name out) is a strange one in that it’s not a primer but primes skin brilliantly for makeup, it’s not a serum but it feels as though it has the same sort of potent effect, it’s not a moisturiser yet it instantly plumps and makes the skin more comfortable, it’s not an illuminator but it does (almost imperceptibly but still undoubtedly) add glow. It’s like an all-in-one face fixer, adding radiance, hydration and a layer of – there’s no other way to put this – bounce. You know if you were icing a cake and you were a total amateur (me) and you just mixed your icing sugar with water and started to plaster it on? It would sort of do the job, but it would be a bit flimsy and thin on the ground and not have much “body” to it? Now imagine a proper icing, a fondanty icing with that gorgeous sort of elasticity and fullness – this is what the Estee Lauder Anti-Aging Wake Up Balm is to my cakey, crumbly, dry morning face. What’s in this wonder balm? Well, the hero ingredient for the Revitalizing Supreme franchise appears to be a very potent and stable extract from the Moringa plant, which they claim helps to boost the skin’s defences against environmental aggressors (smoke, pollution, etc) as well as increase collagen, elastin and hyaluronic acid production. So basically: bouncier, plumpier face. There’s also Prickly Pear extract for extra nourishment, powerful anti-oxidants and anti-irritants (including Vitamin E) to keep the skin calm and on an even keel, and glucosamine to help increase cell turnover for brighter-looking skin. Now look, I’m telling you all of this but actually it’s the short-term benefits that prompted me to write this little rave review. Don’t get me wrong, I’m not saying that the longer-term effects aren’t noticeable; have I seen a fresher, dewier complexion after weeks and weeks of morning Wake Up Balm application? Yes, I think I have. And I’m sure that when I get around to using the cream as well (I need to dig it out of the product quagmire in my office) the effects will be more prominent. But it’s the instant effects that make me go back to this balm time and time again – it’s just brilliant underneath makeup as an instant plumpifier. Sometimes I just use it straight after serum – it’s moisturising enough – other times I layer it over serum and moisturiser and end up looking as though I’ve been to one of those LA doctors to have my face pumped full of special youth juice! It’s plumption in a bottle, it’s smoothness in seconds, it’s fondant icing for the face and it’s perfect for those who have always wanted to try a glow primer but don’t want any actual glow. No shimmer, no glitter, no OTT shine, just a cushiony finish with a touch of radiance. 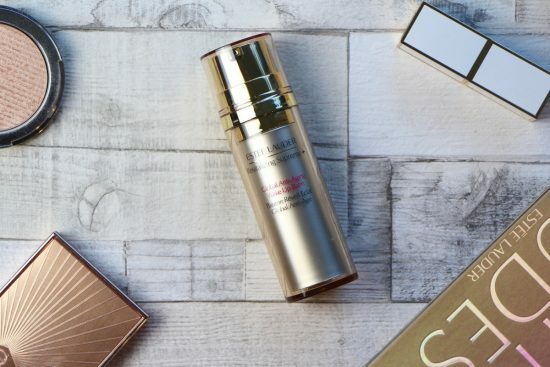 It’s what I always wanted the Beauty Flash Balm from Clarins to be – an all-round one-step face fixer. 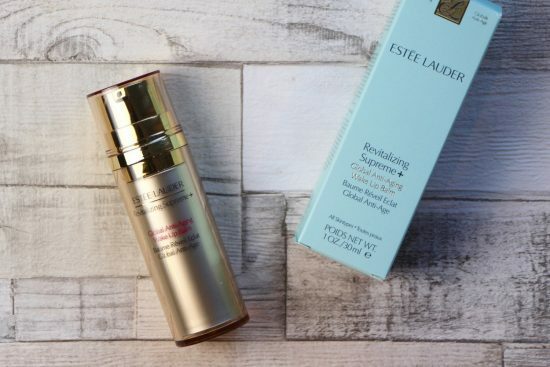 You can find Estee Lauder Revitalizing Supreme + Global Anti-Aging Wake Up Balm at Feel Unique and Estee Lauder – it’s £46. I’ll report back on the cream when I get a moment!